Welcome to ICLabel. The goals of this website are (1) to help EEG researchers who use independent component analysis (ICA) to distinguish independent components (ICs) as brain or non-brain sources and (2) to collect a large number of crowd-sourced IC labels. Users who go through the tutorial material and then volunteer to label new ICs based on their presented properties are contributing to the development of an accurate automated classifier that will be soon be released as an EEGLAB plug-in and integrated into basic EEGLAB functions. 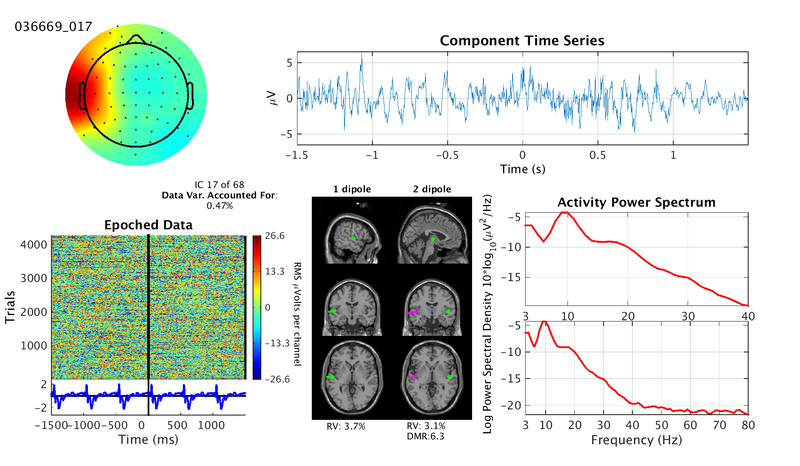 A version that operates in real-time will be integrated into the Real-time EEG Source-mapping Toolbox (REST). For more information, see Why Help Us?. For information on how the ICLabel project implements crowd sourcing, see this technical paper. If you're not experienced at labeling components, see Telling Components Apart and then Practice Labeling (with feedback). If you don't know how to enter component labels on this website, see How To Label. It is essential that you understand these instructions before you begin. Click Label EEG Components and study the presented set of component properties. Try to decide what label or labels best describe this component. For more help, return to step 2 above. To label the component, click the appropriate label or labels. For more help, return to steps 2 and 3. Then click "Next" to receive another component to classify. To leave the site, just close the window. That's it! Please read the text in all the links above and perform some Practice Labels. Then click Begin Labeling. If you have any suggestions, please Leave A Comment. Also ‒ there is a Leaderboard! Properties image for a left temporal brain IC in an experimental paradigm in which stimuli appear at 500 msec intervals.